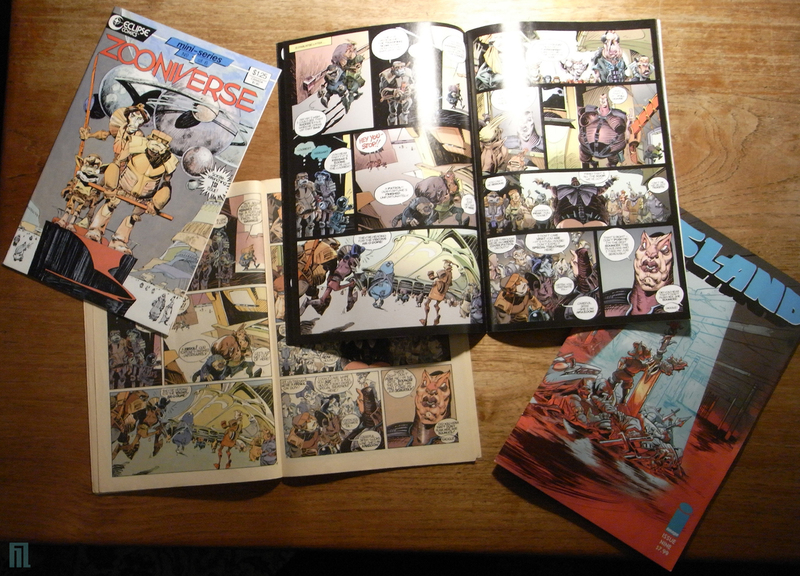 Yep, finally the wait is over, you can go to your local comic store and buy the chapter one of Zooniverse! The serialization begins in issue #9 of Island Magazine published by Image Comics: Here's the official page. A comparison of the old and new editions. It's been a long haul since my first post in may of 2011, but I've finally reached a huge goal. This blog records my efforts trying to relaunch Zooniverse with limited funds and resources. I've tried everything I could think of, animation, self publishing, iPad app, commissions, online sales and Patreon. Now I have a color comic sitting on my desk and it looks better than it did 30 years ago! I couldn't be happier and I owe it all to Brandon Graham giving me a second chance at the comic industry. Island is his brainchild, a Heavy Metal magazine for Image. I began collecting Metal Hurlant and Heavy Metal in 1977 when I was fourteen years old. All those artists, all that inspiration. Corben, Moebius, Bilal, Forest, Caza, Druillet, Claveloux, Mezieres and Franquin so many visions that would help me escape the mundanities of urban bleakness. I dreamed of submitting comics to Heavy Metal, and Zooniverse was my thank you to all those who inspired me. They had set the benchmark and at the tender age of twenty one I did my best to meet it. Thirty two years on and here we have Island, a brand new comic magazine that I can be a part of because Brandon found Zooniverse inspirational when he was growing up. It feels so destined. Still, there is a lot of work ahead and I am happy to do it. Currently I'm halfway through recoloring chapter two (the original 2nd issue). Helen Maier has gracefully agreed to return to her old job helping me color Zooniverse so that deadlines can be met. She is doing the first pass of coloring (flatting) on chapter three. I've completed a brand new Gatcheralis story for Island issue #10. I have moved my attention away from this blog and onto Patreon where my posts are financially compensated which has helped greatly. At Patreon I've done one hundred and fifty posts and published thirty two PDFs for the higher tiers which has taken the place of self publishing. Three of the PDFs are old Zooniverse comics, one of which has never been published before. I will always release free posts for important announcements so it's worth bookmarking and checking out occasionally. Thanks to my patrons I am preparing a new Zooniverse animation. It's a short test, but I would like to do more in the future. Thank you for all of your encouragement and support as I complete this blog and move on.